We have arrived in New York and are collecting matchboxes for our global project “People Make Places”. 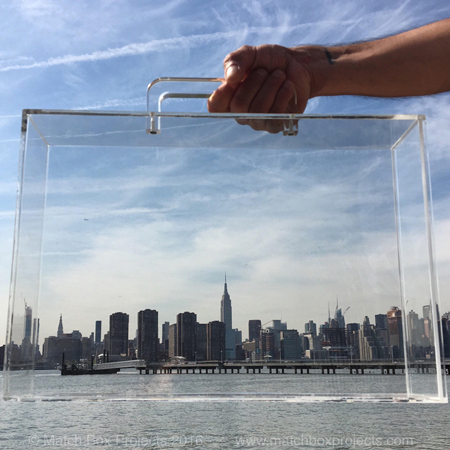 We welcome those living, working and/or studying in New York to join this project by creating a miniature impression of what New York means to you inside one of our signature matchboxes. Meet up with us across the five boroughs over the coming days to pick up or deliver a matchbox. Areas we will be in will be uploaded to this blog daily and/or every few hours. Feel free to contact us to suggest a rendezvous pop up or place we can conduct a free workshop for those who would like some inspiration and assistance with their creations. This entry was posted on Wednesday, May 25th, 2016 at 10:49 pm	and is filed under Our Blog. You can follow any responses to this entry through the RSS 2.0 feed. You can leave a response, or trackback from your own site.